Raw talent vs. expensive packaging is always a pleasant surprise in the entertainment business. 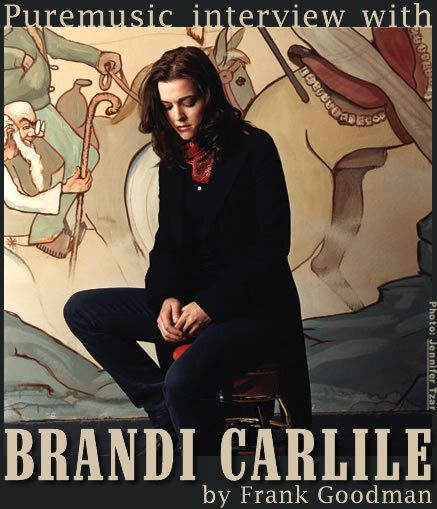 Brandi Carlile is the very rare exception to the rule; she and her band made their own EP, piece by piece with their own money, and Columbia ended up buying it and putting it out. Rolling Stone chose her as one of the 10 Artists to Watch in 2005. The subsequent Columbia full length debut CD contained new versions of a number of the songs from the EP. Relentless gigging leading up to the EP and through the debut had already moved her through various styles with her running twin partners, the Hanseroth Brothers. Tim and Phil had had a hard rock band called The Fighting Machinists, and they bring that honed edge to the BC sound. She is not only a vocalist that can literally do it all, the band itself moves fluidly and convincingly from flat out country right through edgy pop radio rock. She's the only artist you can see on CMT whose main cited influences are Elton John, k.d. lang, Jeff Buckley, and Radiohead. One hears all the time now about how acts getting tunes on Grey's Anatomy can practically launch their career, but in BC's case, there was a Grey's episode that actually debuted a version of the video for Brandi's big song "The Story." Overall, no less than four of her songs have been used in the show. She's hot, super talented, and a driven workaholic. She's a small town girl (Ravensville, 50 miles from Seattle) who has already met and won over most of her idols. Elton John called her to thank her for the nice things she'd been saying in the press about him and sent her flowers. The Indigo Girls are singing on "Cannonball" from the latest release. T Bone Burnett brought what sounded like his whole record collection and his trove of ancient instruments up to the studio to produce. If she and the twins keep coming up with the right songs, she is unstoppable.